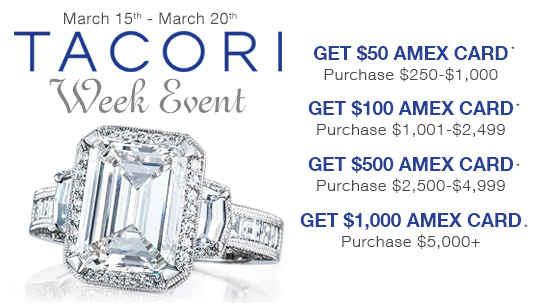 That’s right, all Tacori, all the time, for two days: March 19-20, 2016 at the J.R. Dunn Jewelers showroom at 4210 North Federal Highway in Lighthouse Point, FL. 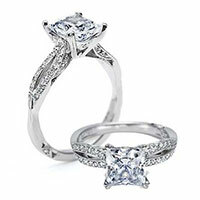 The in-store event will feature Tacori bridal and fashion collections. Additionally, visitors will have the chance to talk with a Tacori representative up-close and personal. Jewelry specialists from J.R. Dunn Jewelers’ e-commerce division are standing by now through Sunday to assist with online purchases. More than 500 engagement rings with the designer’s iconic crescent design will be on display, along with his and her wedding bands, in platinum and 18kt white, yellow are rose gold. A Tacori Sport Band is Tacori’s gift to every guy who buys a Tacori wedding ring. Handcrafted, made-in-the-U.S.A Tacori engagement settings accommodate assorted diamond sizes, shapes and styles. J.R. Dunn has an extensive selection of diamonds for you to choose from, many with GIA (Gemological Institute of America) certification. Jewelers will be on-site at the event, available to set diamonds in Tacori engagement mountings. Check out the brand’s fashion line, too, for jewelry with blue gemstones that are perfect for wedding days! The sterling silver Island Rains and Barbados Blue and yellow gold Golden Bay collections are devoted to the hue, along with half of the Sonoma Skies collection. The Tacori engagement keepsake memory box and journal, and Promise bracelet make ideal engagement and wedding gifts, too. Join J.R. Dunn Jewelers and Tacori on Saturday from 10:00 a.m. to 6:00 p.m. and Noon until 5:00 p.m. on Sunday. Call 954-782-5000 for an appointment today! Visit JRDunn.com and then call 866-362-5787 to speak with a friendly and knowledgeable online jewelry professional.